Your body is meant to move pain free and function smoothly. Today, chronic, on-going neck issues and upper back pain are extremely common. The increase in computer work, video games and texting is a huge factor. Stress also negatively effects the neck and upper back as many of hold our tension there. Shoulders have an amazing mobility, allowing us to do dynamic overhead movements. The shoulders are easily injured however, especially in lifting and throwing sports. Shoulder injuries are generally always to the soft tissues of the shoulder (muscles, tendons, ligaments, capsule) and repair well with the right combination of manual therapy. Are you dealing with a pain in your neck? Maybe you've been suffering with neck pain for years or maybe it's started to creep up recently. It's just a part of your day you deal with because you have stuff to do: kids, jobs, spouse, house stuff. Your neck aches all the time, it grabs on around your shoulder blade and pulls up into the muscles behind your jaw, or it starts at the base of your skull and aches down the side of you neck giving you a wicked headache. Can you remember the last time you got a good nights sleep? Probably not since when your neck hurts, you toss and turn and wake up feeling exhausted. Sometimes your neck feels a little looser and not so sore, and there's no headache or jaw pain. Its great, but after an hour at work you start to feel it again. It gets so bad you feel like you can’t stand it, you try to stretch it at your desk but that does not really help. Here's the good news, you're closer to finally getting relief from your neck pain. At Head 2 Toe, you'll experience our team of expert doctors and clinicians who've helped others just like you find lasting relief. Your will probably feel neck tension, pain behind the eyes or temples, jaw pain and pain in your scalp. Causative factors for tight muscles include eye strain from video or computer use, poor posture from computer use, video games and texting both resulting in neck strain, poor diet, dehydration, sleep posture, recent whiplash injury (whether in sports or in a car accident), or stress. Tight muscles in your neck can also cause pressure on delicate upper cervical nerves causing migraines and occipital type headaches. These headaches can be severe and long lasting. 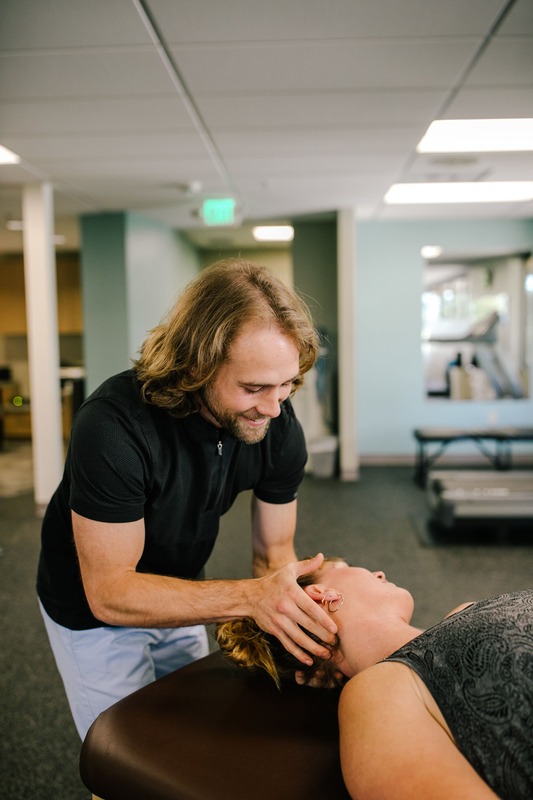 Skilled soft tissue therapy combined with gentle chiropractic manipulation is key to relieving your pain, and provides an actual solution for your headaches and is safer than taking ibuprophen or acetamataphine. Frozen shoulder or adhesive capsulitis is extremely common in women over 50. It is a very painful condition and requires expert Clinical intervention. There is a general confusion around correct management of frozen shoulder, and many people go for months or years with severe pain. Correct management includes early intervention and aggressive manual therapy and rehabilitation to slow the progress. If your shoulder is hurting you constantly, waking you from sleep and your mobility is restricted, please don’t wait. Simply click the button below to get your appointment scheduled, we know how to help you fix your shoulder. Impingement syndrome and bicep tendonitis are very common in lifting sports including CrossFit and Orange Theory Fitness. Most of us have a tight upper back, a forward head posture, maybe slightly rounded shoulders and work at our computer way too much. We finish work and head to the gym, throwing weights overhead and not paying quite enough attention to prepping for movement. Then, our shoulder starts to pinch and hurt, usually on the top, front of back of the shoulder. We have to remember that the shoulder has this amazing dynamic movement, and is purely a musculoskeletal joint, meaning it is just held together with soft tissues. Our shoulder joint is a ball and socket joint and if the ball is not sitting perfectly in the socket, and staying in the socket as we lift overhead, we get in trouble. If our upper back does not move, or our shoulder blades do not move, we get in trouble. If your neck is stiff, your shoulder will get into trouble. You need a skilled team to assess your shoulder and put all the components back together.